Try to prepare your ingredients in advance as much as possible. Most recipes are simply ‘chop & plop’ so it’s pretty straightforward. If you’re in a real rush you could always pick up pre-chopped vegetables from your supermarket. It’s always best, and most efficient, to boil the water used for the stock or liquid addition just before adding it to the soup-maker. If you use water straight from the tap, you may find some vegetables aren’t quite cooked when the soup’s ready, especially if the vegetables are cumbersome or tough. Starting with hot stock gives it a better chance to add more flavour and taste. Chop your ingredients into small pieces, especially tough veggies such as potatoes, carrots, squash and turnip. This allows the vegetables to fully cook in the short soup maker cycle. Ensure the lid is placed fully on and secure. Due to the starch and sugars present in some foods, a slight burning may occur if they are placed in direct contact with the inside base of the jug. To prevent this, add half a cup of water or stock to the Soup Maker before placing in any solid ingredients. Then top up with the remaining liquid specified in your recipe. Follow your manufacturer’s minimum and maximum guidelines. The Morphy Richards Soup Maker jug has these clearly marked on the inside of the jug. Do not submerge either part (lid or jug) of your soup maker fully in to water when cleaning. These contain electrical components that can be damaged by water. Take time to have a good read of the Morphy Richards instruction manual to help ensure longevity and optimum use. NEVER fill your soup maker outside of the minimum and maximum fill levels. Keep soup makers and kettles away from the edge of counters to avoid them being dragged over the edge, especially if you have children. Do not be tempted to open the lid during cooking. Although designed to cut out, the soup maker contents may still splash over you. Don’t attempt to use the soup maker to warm up pre-packaged or shop bought soup. It’s designed to make perfect soup from scratch and anything else may burn to the base of the element, causing damage to the product. It may sound obvious, but you’d be surprised! Finally, it goes without saying, NEVER touch the serrator blade. Always be careful when handling and cleaning the blade element of the soup-maker. 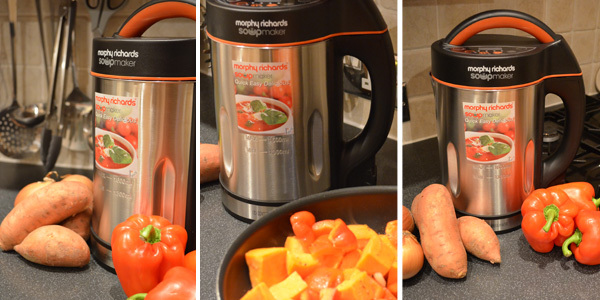 Take a look at our Sweet Potato & Red Pepper Recipe for a step by step guide to making it in your soup maker. cooking, kitchen, Morphy Richards, Soup, Soup Maker. Bookmark. Hi I’ve used my soup maker a few times but my veg soup only came out nice twice. Veg was still hard. I’ve tried putting hot stock in first but it seems to cut off before end of timer as if it’s too hot. Tried putting cold water in at start too and veg is still hard. I have spoken to our Cookware department, and they have advised that you return the soup maker back to the store in which you purchased it from. If you bought the soup maker from us you can return it via post or by personally delivering it back to our store. However, when returning this item to us please make sure that you have a proof of purchase and proof that it is still within its 12 month warranty. This should all be displayed on your till receipt or your confirmation email. It never blends all my fruit always big chunks in the drink still any help ???? Unfortunately we do not stock the Morphy Richards Soup & Smoothie maker, we only stock the Soup Maker. We suggest that you contact Morphy Richards directly as they will have more information on the product. Please could you contact our Customer Service Manager Alex via email to discuss the matter further? Please can u advise me how to use barley in my Morphy Richards soup maker. Shoumd it be soaked or pre-cooked? It is the best thing i have. I would be lost without it. It should say on the box whether barley needs to be pre-cooked or soaked. If not, please let us know and we will try and find out for you. We will need the name/model of your soup maker to find out, as there are numerous styles out there. Unfortunately, it sounds to us as though the Soup Maker is faulty. The guarantee on a Morphy Richards Soup Maker is usually for 2 years, however please check the box or provided leaflet to confirm. If the Soup Maker is still within its warranty we suggest that you send it back to where you purchased it from originally and explain the situation, hopefully they will be able to advise you further. If you purchased the Soup Maker from us then please give us a call on 01432 377089, or visit our Widemarsh Street store, where a member of staff can advise you further. I know u cannot put uncooked meat in the morphy Richards complete soup maker but what about raw fish such as cubed salmon or cod. Fish cooks so quickly surely it would be ok – especially on the chunky setting. Grateful if u could let me know as I don’t want to make myself ill but as an ardent fish sop maker (on the hob in a saucepan) I am disappointed to find this may not be possible in my new Morphy Rchards Complete Soup Maker given to me this week as a gift. We can only advise that you follow Morphy Richards’ cooking instructions for your Soup Maker. My soup is always thin, tasty but thin! How do I thickren soup in the soup maker? To thicken up your soup you could try adding more potatoes or lentils to your mixture. You could also try adding cornflour, this ingredient is perfect for thickening up soups and sauces. We’re sorry to hear that your soup maker has developed an error. The most common cause can be that the container is overloaded therefore not allowing the blade to function smoothly. This can easily be resolved by reducing the amount of food in the container. We hope this helps but please do not hesitate to contact us if we can be of any further assistance. If my soup is very thin can I add more veg at the end of the cycle and put it back on again? Yes! You can add more veg to thicken it up as long as you add more potato too so it blends properly. These are amazing tips! Thank you so much! I’m attempting broccoli and cheddar cheese soup and it’s coming up with the error code E and beeps at me. What do I do? Thanks. We’re sorry to hear that your soup maker has developed an error. The most common cause can be that the container is overloaded therefore not allowing the blade to function smoothly. This can easily be resolved by reducing the amount of food in the container. Other common errors are that the jug has not been inserted correctly or the motor has burned out therefore allow some time for the machine to cool down before reusing. We have spoken to a representative at Morphy Richards who has advised not to put lentils or barley straight into the soup maker. Then main reason is that they cook and expand very quickly which will cause the soup maker to stop working as the safety probe will be touched. You can cook them separately then add them when the soup has finished.